Product #17697 | SKU 801-150 | 0.0 (no ratings yet) Thanks for your rating! The PocketWizard FlexTT5 Transceiver Radio Slave is part of an ultra-versatile radio slave system, and is dedicated specifically to the Canon E-TTL II flash control system. It simply slides directly into the camera's hot shoe, and there are no special settings to make or modes to call up. Use the camera, on-camera flash, or flash commander controls for flash compensation, zone and ratio control. It supports single or multiple dedicated flash units. The FlexTT5 is the ideal addition to most Canon E-TTL II flash system. Since this system works on digital radio technology, it can support E-TTL operation around corners, out-of-sight, or in bright sunlight. The FlexTT5 is a "Transceiver", meaning it can be used either as a transmitter when placed into the camera's hot shoe in combination with another FlexTT5 unit on the flash end, or as a receiver with a MiniTT1 transmitter-only unit placed on the camera's hot shoe. Note: These Pocket Wizard trigger cords are NOT compatible: #802-502, 802-511, 804-512. See Accessories Tab for compatible trigger cords. Out of the box, the FlexTT5 is programmed for PocketWizard channels 1 and 2. Each setting can also be programmed to transmit and receive any of 20 ControlTL channels for TTL photography and/or 32 standard channels for manual flash photography. The FlexTT5 Transceiver also has a three-zone selector switch which integrates with Canon zones and ratios. The Learn Mode enables programming channels in the field with other PocketWizard radios. Enables X-sync speeds of up to 1/8000 with full-power flash. High-Speed Sync provides auto flash with the camera's shutter speed setting, up to 1/8000th. Unique programming optimises HSS for better operation and more shots per set of batteries. Features a hot shoe on the top, so that you can still mount a flash unit directly onto the camera. This allows you to combine your remote flash with the on-camera flash, or use the on-camera flash for additional E-TTL II control only. Hot shoe contacts automatically detect dedicated ETTL or simple hot shoe flash. Features a hot shoe on the top, so that you can still mount a flash unit directly onto the camera. This allows you to combine your remote flash with the on-camera flash, or use the on-camera flash for additional E-TTL II control only. 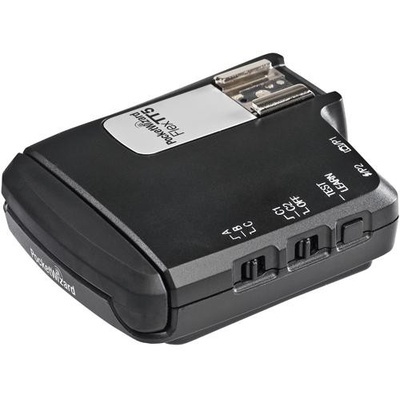 The FlexTT5 Transceiver has two plug-in ports for use with remote Canon E-TTL II cameras or other non-TTL flash units. Camera remote triggering requires use of a camera-specific ACC-type cable. This mode can be used to trigger a camera remotely and requires use of a camera-specific ACC-type cable. Auto Relay Mode allows you to trigger a remote camera in sync with a remote flash. The FlexTT5 lies flat to stay out of the way and uses a flip-up antenna for additional range when needed. The FlexTT5 features a mini-USB port, which makes it upgradeable and "future-proof" for continuous improvements and compatibility upgrades. The included PocketWizard Utility software allows you to select custom settings through the USB connection and to set it to use specific channels used by other Pocked Wizard units. While the FlexTT5 works ideally upon many older Canon flashes, the 580EX, 580EX II, and 430EX emit strong RF noise across the PocketWizard's frequency range, and this significantly reduces out-of-box range performance of the FlexTT5 Transceiver. In PocketWizard's research, the interference from the flash varies wildly from sample to sample. They can only guarantee that the flash will work to ~30' (~10m) in all conditions.